Dice are arguably the most iconic symbol of gaming and have been part of humanity’s leisure activities dating back to the Old Testament, ancient civilizations, and even prehistoric times. Despite their age and simplicity, dice continue to be important components in modern games. Why is this? How has a simple cube (or other polyhedron) with different numbered faces remained so important to gaming? A die is basically a random number generator. As long as the die is not loaded or poorly manufactured, each face should have an equal chance of ending face up. Random numbers are very useful in computer games, special effects production, simulations, statistical analysis, or cryptography so it should be no surprise that a simple physical object that can generate such data might be useful. Yet, a typical die only generates six different numbers. How have game designers managed to find so many uses for dice for so many years? One of the most common roles dice play is to limit a player’s options. In Chess, at any given moment a player might have dozens of legal moves to choose from. One can sit there and analyze each move available in the hope of finding the best one. Hence the need for chess clocks. Imagine if the same freedom was available in a party game such as Trivial Pursuit! If on your turn you were free to move to any one of a dozen different spaces you might spend several minutes each turn deciding on the best possible spot to move to, thus dragging the game to a halt. But this doesn’t mean that dice are only useful for making a game less complicated. In Backgammon the limitations on movement created by the dice is precisely what makes the game interesting. How can you best use your limited number of pips to push your checkers toward your goal? Limited choices can therefore reduce complexity but also encourage creativity. Dice are also often used to simulate odds. This is particularly true in wargames. 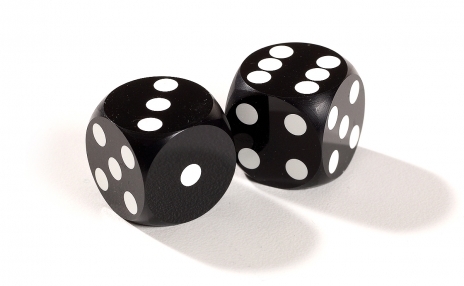 If an event has a 50/50 chance of occurring then you simply need to roll a 4 or better. Events that are more difficult to achieve might require a 6. When a second die is added to the mix all sorts of new possibilities open up. We find a very simple version of two dice interacting in Monopoly where a roll of doubles gets you another turn, but the various possible results of rolling two dice and the odds of any of those results appearing allows for the simulation of a number of semi-random events. Since ancient times dice have become more sophisticated, with meticulous production techniques that have transformed simple dice made of bone or ivory into the precision dice of today. Ironically, I think that the strive for perfectly weighted dice remains connected to their most primitive function – representing a player’s fate. Ancient dice were used to tell people’s fortunes or to determine the will of the gods. If you rolled poorly it meant something. Precision dice and dice cups and towers seem like modern devices but the goal is not that different from that of ancient dice players – to make sure that the person rolling the die can’t influence the result. This also explains the importance, and pleasure, of feeling the dice in your hand and actually rolling them. Though we may no longer believe that dice are controlled by spirits, we still curse our luck when they don’t roll the way we want them to and we still feel personally connected to their results even if we know that the dice themselves don’t care who is doing the rolling. In short, dice remain important because they create the narrative of our games. They give us obstacles to work against, simulate the world of the game, and connect us personally to that moment in time as they tumble out of our hands.